The Denver metro area real estate market saw all-time highs in 2013 for both home sales and average price, according to Metrolist®, Colorado’s largest multiple listing service (MLS). As of Dec. 31, 2013, 54,024 residential homes had sold in the Denver metro area, a 17 % increase over 2012, and the average sales price was $306,910, an increase of 10 %, year over year. Single family detached home sales broke records, accounting for 42,762 of the properties sold in 2013 and netted an average price of $336,381. The previous record for Denver metro Single family detached home sales was 41,682, set in 2004. Sales of single family attached homes were up 23 % over 2012, with 11,262 properties sold in the Denver metro area through November. The average price for a single family attached home in 2013 was $198,220, a 10 % increase over 2012. Strong demand and low inventory helped drive the record-setting sales and prices. Active listings for 2013 were down 16% compared to 2012. As a result, residential properties spent an average of just 58 days on the market in 2013, compared to 77 days in 2012. The Denver metro area real estate market remained strong through December, with single family detached residential properties selling for an average price of $336,857 in the 11 Denver counties. 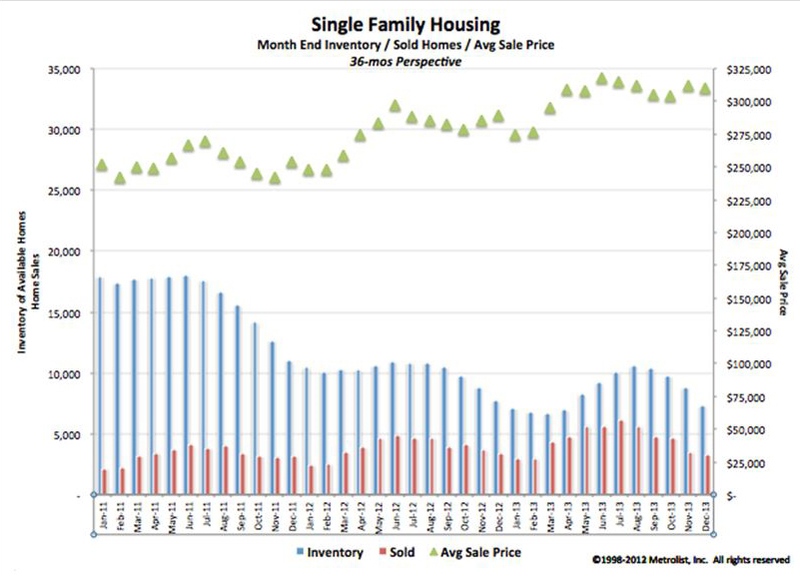 Inventory remained tight through the holidays, with properties averaging 57 days on the market, down 22 % from December 2012. Metrolist is the largest MLS in the state of Colorado, supporting the largest network of Realtors® with the most comprehensive database of real property listings throughout the Front Range. Realtor-owned since 1984, Metrolist provides leading technology solutions to real estate agents and brokers to better serve buyers and sellers. Whether you are entering the market as a seller or as a buyer, you are welcome to sign up for a free account at www.SearchColoradoHome.com to receive housing information for specific areas or the newest listings on the market. This website offers advanced search features and filters for price and location, as well as search by school districts, amenities, construction type, and many other search options. This comprehensive site enables both buyers and sellers to enter the housing market well informed.